According to the FMCSA, there were over 415,000 police-reported crashes involving large trucks in 2015. That is a lot of trucks to fix, whether for mechanical work, bodywork, or both. To get a truck back on the road, it takes a lot of hard work and talent. At TransAm Trucking, we have a skilled team working continually to get trucks out of the shop and back onto the road. Craig Lockett is a part of TransAm Trucking’s Body Shop team and has been for 4 years. 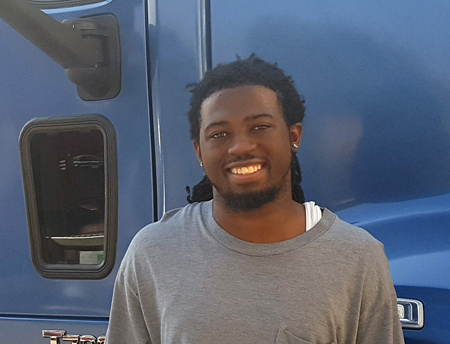 Craig originally applied for a Tire Technician position but the position ended up being filled internally. However, Management was impressed with Craig and did not want to let him go. They offered him a Porter position. Craig accepted. Now, he is a Painter and loving every minute of it. When asked why he enjoys his job, Craig says, “I love the challenge of it.” Painting, whether it is on a canvas or a truck, is an art. A great deal of skill goes into matching paint colors. Then there is the painting itself. It takes a steady hand and watchful eye to ensure the paint is applied evenly and does not clump. “Patience,” Craig says. That is what gets the job done. Craig is a charismatic guy with a passion for his job. Thank you, Craig, for choosing to join TransAm Trucking’s team. We appreciate your hard work.